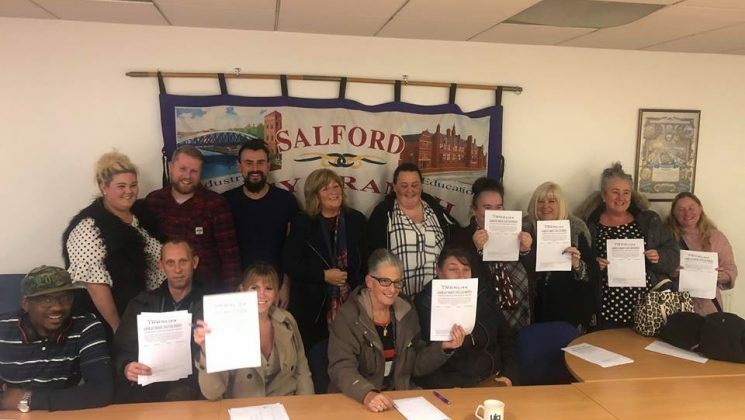 Within weeks of a decision to end top-up payments for sleep-ins, UNISON ensured that members in Salford won’t lose a penny. Just over three weeks ago, employees of social care company Lifeways were told that they would no longer be receiving top-ups to payments for sleep-in shifts that were set up earlier this year to bring their wages to the level of the National Living Wage. If implemented, this decision would have cost some staff thousands of pounds a year. Following the Mencap v Tomlinson-Blake decision earlier this year, social care providers were no longer under any legal obligation to pay the Living Wage for sleep-ins. Lifeways were not being paid enough by councils and health trusts commissioning social care to be able to continue to make these payments to staff. The announcement came only two weeks after Lifeways workers in Salford celebrated as UNISON was recognised for collective bargaining purposes by the company. This recognition was won by staff joining UNISON and immediately showed its worth, as within days of staff receiving the bad news, Salford City UNISON were round the table with Lifeways resolving the problem. A solution has now been reached, which will ensure staff will not only keep their wages at the previous level, but in some cases improve them – as the top-ups system will be replaced by an hourly rate that will guarantee not only the Living Wage, but also protect any wages that are paid above that right during day-time shifts. Organising a meeting of Lifeways members within days of the announcement. At that meeting union members voted unanimously to enter into a strike ballot if the wages were not reinstated. Contacting commissioners at Salford Royal NHS and councillors at Salford City Council, who intervened to help negotiate a deal that will help protect staff and service users. Meeting with Lifeways and negotiating a positive outcome for our members. This is not just an issue affecting Lifeways employees. Attacks on sleep-in rates and generally poor wages are endemic across social care. Many companies don’t care and even those that do struggle to pay decent wages because of underfunded contracts with commissioners and a Government that isn’t willing to ensure social care is properly resourced. UNISON is fighting for social care and our victory in Salford shows that we can win. If you work in social care, join UNISON. Salford City UNISON Updated Position on Brexit – We Demand a General Election Now!